Legal migration, particularly from less developed to more developed countries, is much more readily available to highly skilled people with recognized qualifications than it is to workers without formal qualifications. 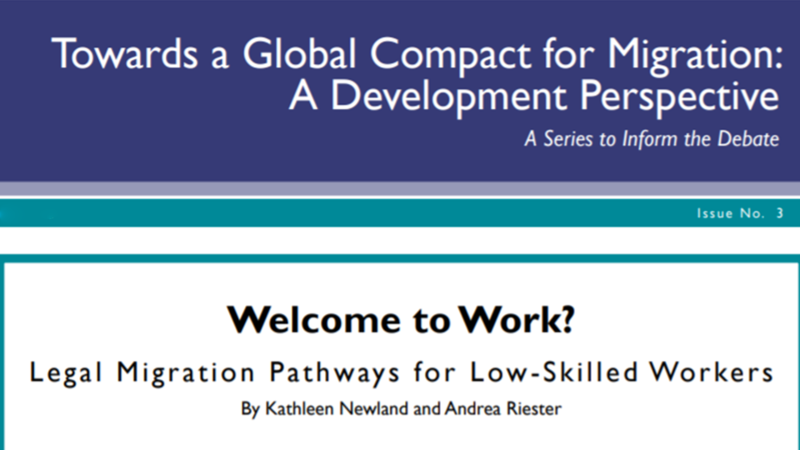 This policy brief will explore the international migration opportunities available to low-skilled workers, the constraints on their movement, and the development impacts of these patterns. This publication results from a partnership between the Migration Policy Institute (MPI) and the Deutsche Gesellschaft für Internationale Zusammenarbeit (GIZ) GmbH, supported by the German Federal Ministry for Economic Cooperation and Development (BMZ). It is part of the series “Towards the Global Compact for Migration: A Development Perspective,” which aims to enrich the conversation around migration and development in the context of the ongoing discussions on the Global Compact for Migration.